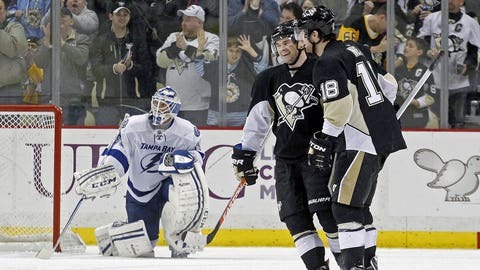 The Penguins' James Neal and Chris Kunitz celebrate Neal's overtime winner against the Lightning. Pittsburgh Penguins coach Dan Bylsma wanted his team to play a tight, low-scoring game against Tampa Bay on Saturday, figuring it’s what the Metropolitan Division leaders are likely to see when the postseason begins next month. ”That’s a game we’ve got to be comfortable playing,” Bylsma said. Of course the Penguins are pretty good when the defense loosens up too. They gave Bylsma a bit of both in a 4-3 overtime win over Tampa Bay on Saturday. James Neal’s searing slap shot over Anders Lindback’s right shoulder 1:27 into overtime capped a frantic final 15 minutes of play as the teams traded the lead three times. Neal’s power play goal extended Pittsburgh’s winning streak over the Lightning to nine straight. Evgeni Malkin had two goals and two assists — including the setup for Neal’s winner — while Sidney Crosby added a goal and two assists for the Penguins. Jeff Zatkoff stopped 21 shots as Pittsburgh snapped Tampa Bay’s season-best five-game winning streak. Steven Stamkos, Valtteri Filppula and Ondrej Palat scored for the Lightning, who have recorded at least one point in eight straight games. Lindback made 25 saves but had no chance on Neal’s 23rd goal of the season. The NHL’s best power play finished 3 of 6, including Neal’s rocket after the Lightning were called for too many men on the ice 1:11 into the extra period. ”It’s tough when they’ve got four of the league’s best scorers out there pretty much,” Lindback said. The teams spent two periods playing the kind of conservative hockey more suited for late spring than the wide-open attacking style more fitting for two of the most offensively talented teams in the league. No matter, they made up for it in the third. Stamkos broke a 1-1 tie 8:17 into the final period when he poked a rebound underneath Zatkoff’s legs to put the Lightning in front. The lead lasted less than three minutes, as Malkin pounced on a rebound off a Matt Niskanen slapshot into an open net for his third goal in two games. Malkin’s 23th of the season came with 3:17 left in regulation when he powered a shot by Lindback that seemed to deflate the Lightning. Tampa Bay, revitalized since Stamkos’ return from a leg injury two weeks ago, responded. Palat stunned the 319th consecutive sellout crowd at Consol Energy Center when he cleanly beat Zatkoff to tie the game at 3 with just 1:22 left in regulation. Still, a chance at two points evaporated when the Lightning were caught in an awkward line change just over a minute into overtime. The Penguins needed just 16 seconds to win it as Malkin set up Neal in the forward’s favorite spot at the top of the left circle. The puck was a blur as it sailed into the net as Pittsburgh bounced back from a 5-4 overtime loss to Detroit on Thursday when the Red Wings scored on a bounce off a Penguins defenseman with less than a second to go in overtime. Pittsburgh’s resilience put a damper on the end of an otherwise successful three-game road trip for the surging Lightning. Fueled by their star — and his elevation to captain after Martin St. Louis was traded to the New York Rangers — Tampa Bay has sprinted to third in the Eastern Conference standings. They certainly looked like one of the conference’s elite while trying to end a lengthy bout of futility against Pittsburgh. Tampa Bay clogged the neutral zone and seemed to have the upper hand at times when the teams were playing at full strength. NOTES: Bylsma said there’s a ”possibility” goaltender Tomas Vokoun could play before the beginning of the postseason, though it seems unlikely. Vokoun has been out since training camp while recovering from a blood clots. … Zatkoff picked up the first point of his NHL career with the secondary assist on Crosby’s goal. … The Lightning host the New York Islanders on Monday while the Penguins welcome the St. Louis Blues on Sunday.